I am delighted with the strength of the final two Fight Card titles for 2014. As we wrap-up three years of monthly novelettes with 40 published titles (including two Fight Card charity anthologies), the stories in the series are as vibrant and hard-hitting as when we started. 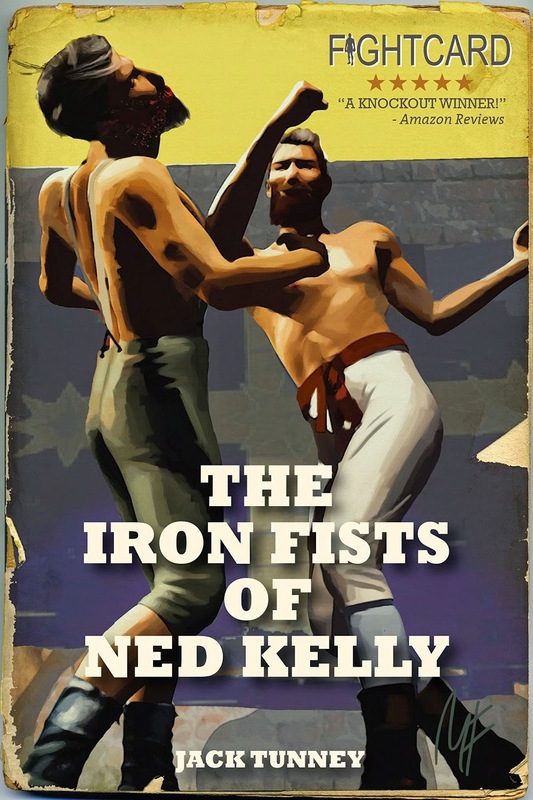 First up in November is The Iron Fists of Ned Kelly, the third Fight Card novel from the battered typewriter of our man from the land down under, David Foster (King of the Outback, Rumble in the Jungle). This is a piece of historical fiction – featuring Australia’s infamous outlaw, Ned Kelly – which David was destined to write. A rip-snorting true tale of a man done wrong who has a chance to even the score the best way he knows how – with his fists. The Iron Fists of Ned Kelly also features a knockout cover from illustrator Mike Fyles, who has also turned in another dynamite cover for our second Fight Card Sherlock Holmes outing from Andrew Salmon, Blood to the Bone, which will be our December Fight Card title. The story of Australia's ironclad outlaw, Ned Kelly, has been told countless times in film, book, and song. The shootout at Stringybark Creek and the infamous siege at Glenrowan are events which shaped the nation – but there is more to Ned’s story, including the character defining, bareknuckle, scrap with feared bar-room brawler, Isaiah 'Wild' Wright. Ned was only sixteen when he rode into the township of Greta on a horse loaned to him by Wright. Ned had no idea the horse was stolen, but he was still arrested, beaten, and sentenced to three years hard labor. Ned can't get those years back, but he can make the horse thief pay for his deception. With honour and justice at stake, two of the hardest men of all time will come to scratch in a battle for the ages. A story of betrayal, revenge, and ultimately friendship, The Iron Fists of Ned Kelly is another rollicking tale from the author of King of the Outback. Along with his Fight Card entries, David is also the author – under his James Hopwood pseudonym – of two novels (The Librio Defection / The Danakil Deception) featuring swinging sixties neophyte British agent Jarvis Love. Both are available from Amazon and are must reads for anyone who enjoys their spy fiction with the cool vibe of the swinging sixties when martinis were served shaken not stirred.